“विकाराबाद आलं !” (We’ve reached Vikarabad) was a cry perhaps as dear to us as “Land Ahoy” to a weary sailor, for it marked a high point of the day-long train trip home from holidays. The journey till this point was arduous as we headed home, with laden feet and a heavy heart, after spending a memorable summer vacation with my maternal grandparents, cousins, uncles and aunts, stray dogs and cats that were house guests of the season - and mangoes! Not that the train journey wasn’t fun – we monkeyed around climbing up and down the bunks, gingerly testing and almost pulling the stop chain, trying the switches of the quaintly funny Cinni fans and lights, sliding the windowpanes and shutters up and down, much to Mother’s chagrin. But after a while we would tire of these games and begin to feel cooped up in the narrow gauge carriage, wooden bunks biting our bones, bits of coal from the steam engine fume plumes getting into our eyes, and the swaying when you closed your eyes would go away only after a whole day’s or night’s rest. The only highlights so far (till Vikarabad, I mean, in case you lost me) would be the hot and sweet instant coffee Mother had bought us before boarding the train at Latur Road station, which was located many miles out of town and warranted a long bumpy bus ride. What was so great about coffee? Well, instant coffee was quite a novelty still, and (good) kids like us were not allowed coffee or tea. The other highlight would be the lovely lunch Mai, our grandmother, had packed for us. This energetic lady would get up at 3 am to make our breakfast and pack lunch and dinner to last us on the journey. It would be fun to lay out our travelling lunch, open umpteen containers of the towering tiffin carrier and other sundry boxes of all sizes and shapes to discover the goodies. धपाटी (theplas), तिखट मिठाच्या पुऱ्या ( masala pooris ) चुरम्याचे लाडू (churma laddu) soft chapatis and बटाट्याच्या काचऱ्या ची भाजी (crisp stir fried potatoes) गुळ-तूप, तूप-साखर (jaggery and ghee or sugar and ghee spreads) various pickles, hand pounded दाण्याची चटणी (peanut chutney) and दहीभात (curd and rice) were usual, but each time they tasted better than before. Now, we weren’t greedy kids, but somehow there is this inexplicable attraction for the forbidden – in this case the snacks and sweets - gul poli, gul-papdi cha ladu, chivda, sakhrparyachya vadya - Mai had packed for us in plastic bags and boxes in a wicker picnic basket covered with a tea towel and jealously guarded by Mother. Eat the fresh food now and keep the snacks for later - some sane but disappointing advice from her. Waking up as we neared this town of Vikarabad, we would sight the huge rocky boulders, signboards that were now in Telugu and note excitedly that red buses gave way to green ones and black auto rickshaws of Maharashtra became yellow. This point marked the entry into our home state Andhra Pradesh. It meant most of our journey was done. And the cry “विकाराबाद आलं !” revved up our spirits – for the ultimate reason – we would be allowed to buy the most delicious masala wadas at this railway station. Yes, buying food wrapped in old newspaper from vendors was a very exotic experience for us - and buying street food that met Mother’s strict quality control was an unbeatable and somehow unbelievable bonus. Equally fretful were decisions about how many wadas to buy, with Mother giving in with each passing year in deference to our growing appetites and girths and quite simply, to our growing up. This was vindication of the yearlong misery of longing for these delectable morsels on roadside stalls and restrained by the strict prohibition.
" 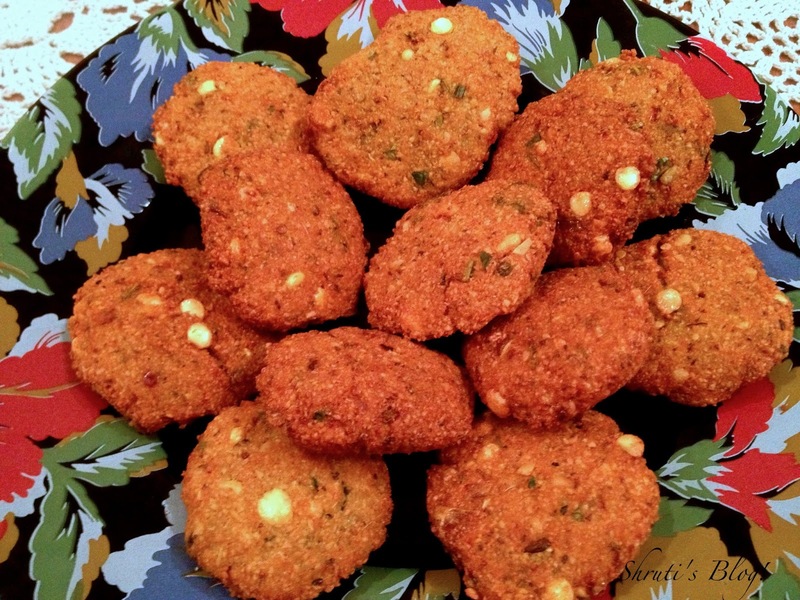 I need to wear pants from this year on..."
The masala wada is a very popular savoury snack of South India and comes with many variations – with fennel seeds, with spring onions, with dill or mint, with turmeric or without, with or without garlic and ginger, round and flat ones, or round balls. Some use only chana dal, while others use a mix of chana dal, urad and moong dal. As "Gateaux Piments" they are very popular in Mauritius, and as "Dal Wadas" they make very popular Iftar food in the Middle East. Marathi/Kannada versions go by the name ambode and are made especially for a festive meal. This is my sixth post in support of my friend Preeti Deo's event A humble giveaway to fight against plagiarism. And I am dedicating this post to the wonderful ladies in this story of my life- Mai and Aai! Pick, wash and soak the dals separately for a few hours. Set aside a handful of soaked chana dal. Peel and roughly cut the onion. Combine all the ingredients except the oil in a food processor bowl and grind coarsely using little or no water. Grinding in a food processor or onion chopper is necessary, as it allows you to grind without any water, unlike a mixer/grinder. Remove the ground mixture in large bowl and adjust the tastes. Add the whole soaked chana dal. Try to shape a wada like a pattie with flattened sides in the palm of your hand. If the mixture doesn’t hold together, add a little besan (chickpea flour). Heat oil for in a wok or kadhai. Test the batter by introducing a small amount pressed into a tight ball. If the mixture disintegrates in the oil, add some more besan. Okay – let me gloat- I didn’t have to add any besan, as I ground the mixture without adding any water. Make equal sized patties with thicker centres and thinner edges, and deep fry them on medium heat till golden and crisp. Remove on kitchen paper and serve hot with a chutney or sauce. Thank you Preeti - glad you liked the post! Yes, those days will never come back... :) so the least we can do is to recreate the dishes and pass down the memories! What a lovely story sis. Yes it's fun while travelling by trains and buses and the journey is full of stories. I loved the masala wadas too. Never knew this vikarabad story. It sounds like karjat cha batata wada when I used to travel pune - mumbai for 7 years. Made me nostalgic . The laddoo of our lives!